Grainy footage shot by Al Jezeera of an F-4 Phantom fighter attacking ISIS positions in eastern Iraq surfaced today. Seeing as only Iran and Turkey fly the Phantom in the region, and Turkey has made it clear that they would not take up arms in the anti-ISIS fight, these jets are most certainly Iranian. Iran's F-4 Phantoms have soldiered on through a decades-long embargo on spares and support equipment, with the jets being maintained by the Iranian industry and parts supplied through the black market. It's thought that just a few dozen Iranian F-4D/Es are actually flyable at any given time. If these reports of Iranian F-4s supporting Iraqi forces are true, it would be an incredibly reckless move by the Iranians as the Obama Administration has stated time and time again that there is no formal military cooperation among the two usual foes when it comes to defeating ISIS in Iraq. But that's assuming we can take the Obama Administration's statements at face value. There have been rumblings that back-channel conversations about the ISIS issue have occurred during the recent Iranian nuclear negotiations. 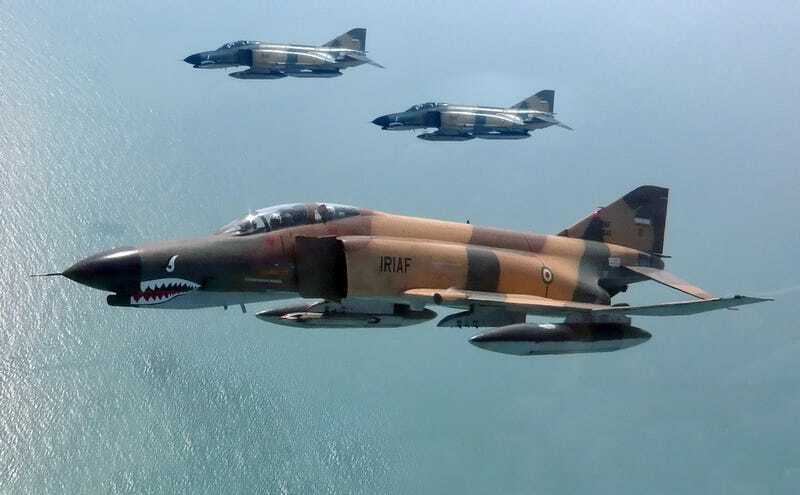 With the US and its coalition partners dominating the airspace over Iraq, Iran's precious F-4s would be at risk of being shot down if they even inadvertently approached a US or coalition aircraft. Alternatively, if the these jets are operating freely over Iraq, and not just racing across the border unannounced and back, it would mean that some sort of agreement has been struck between the US. Such an agreement would be unprecedented and would be inherently risky, as Iranian fighters using non-precision bombing methods and their own rules of engagement could result in massive collateral damage. Seeing as Iran is a Shiite-led country, large casualties among Iraq's Sunni population at the hands of Iranian pilots could deepen the ethnic divides that already plague Iraq and greatly complicate an already intricate situation. I would bet that the truth lies somewhere in between full-on cooperation and flat-out no cooperation or formal communication, with basic deconfliction of coalition and Iranian air traffic through assigned airspace occurring at the very least. These reports also emerge as other accounts have stated that Iranian commandos are assisting the fledgling Iraqi Army and Shiite militias on the ground and that Iranian aircraft are indeed operating out of Iraqi airfields. So far there has been no substantiation to these claims, with today's image being the first from a decent source that shows direct Iranian involvement in the conflict. This just reminds us that the old adage "the enemy of my enemy is my friend" is really the only guiding light in that troubled region. Still, common ground against even the bitterest of foes should not be wasted, and hopefully, if our militaries are corresponding and working together on some level, that mutual understanding could blossom into a much less volatile relationship down the road. Regardless of the possibility of easing of tensions through military cooperation, if Iran is now truly in the anti-ISIS fighting mix with its air power, things just got a lot more complicated in the skies over Arabian Peninsula.